Click on the product names to get a full description. 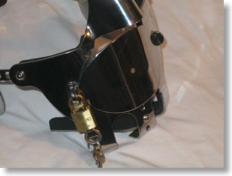 Our beautiful ergonomic collar is manufactured from the same steel the chastity belts are from. You can choose, just as with the chastity belts, from a sanded or a polished finish. This collar is 6 cm high and comes with two D-rings on the side and a O-ring in the front. 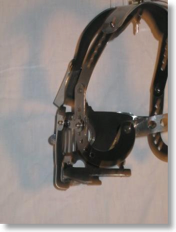 The collar has two hinges on the side and snaps shut in the back by a padlocked hinged closure. This is really a piece of work. Forget posture collars you know, this collar will make sure the wearer will hold his or her head still! 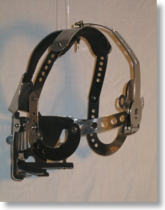 This collar is 8 cm high and comes with an O-ring in the front, chin and neck attachments, back and front plates etc. The collar is made of two parts (back and front) and snaps shut on the sides by a padlocked closure. Optional overhead closure and optional funnel available shortly. The carrara restraints are lined and ergonomically shaped. They match your belt perfectly and are available in an abundance of styles, sizes and appearances. Shown here is the polished engraved version. Comes with a lockable closure. Engravings and extra D or O rings on request. A plain mouth cover, no trespassing. All locked for sure! Only one lock is used on the top. Adjustment in the neck. No flaw when moving the head and no annoying lock on the pillow when lay down! Price: See price list here.